Tim Bomgardner is pleased to serve as the Founder and Executive Director of Interyear Fellowship. 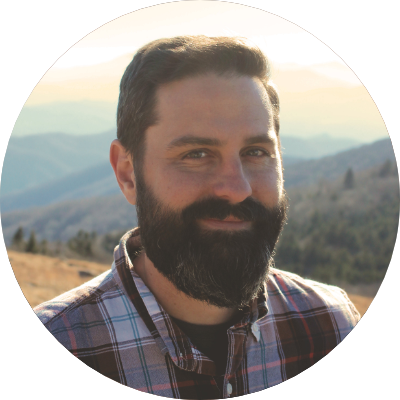 Tim has been on a long journey of discernment that started in Texas and has wound its way through Oklahoma, college at Point University, Emmanuel Christian Seminary, and serving at World Vision in the South Bronx before returning to East Tennessee to work with Appalachia Service Project. Through this path, Tim has valued service to others, a commitment to spiritual disciplines, and a desire to journey with others along the way. His greatest companion has been his wife, Suzy, since 1999. Three young boys (Oscar, Charlie, and Henry) have been their greatest joy and adventure. You might find them all traveling the region in their camper, Marigold. Laura Buffington serves as a teaching pastor at SouthBrook Christian Church near Dayton, Ohio and is currently the Content Developer for Rebel Pilgrim Creative Agency in Cincinnati, Ohio. She is also a storyteller and board member for BeSpoken Live, a non-profit storytelling group in Cincinnati. She's a graduate of Milligan College and Emmanuel Christian Seminary. She cares deeply about the words we use to tell the story of God, ourselves and others. She is especially interested in the work and mission of Interyear because of all the people in her life who were gracious to her through her many years of angst and confusion as a young adult. Benjamin Lee is the Associate Minister at Hopwood Christian Church, which is tucked away in northeast Tennessee, near Johnson City. The congregation is situated between Milligan College and Emmanuel Christian Seminary. Ben’s primary work is ministering with the youth of the congregation, which he has been doing now for nearly 20 years. His congregation also encourages him to cultivate and use his gifts across a wide spectrum of activities. This gives him the opportunity to teach an online class called Christ and Culture, which is the capstone course for all Milligan College seniors. He is a regular volunteer chaplain at the local hospital. He also meets with people for spiritual direction. And, he frequently facilitates and coordinates spiritual retreats. Ben has been married to the love of his life Angie since 1998. They have three wonderful boys (Caleb, Morgan and Patrick). Wayne Rickert is a Christ-follower determined to live out a gospel-response in all areas of life. He is a serial entrepreneur inspired by the challenge of establishing businesses and has worked in the IT world applying creative problem-solving solutions. Wayne is an avid reader and passionate about serving as a volunteer working with homeless and housing issues. Most recently, Wayne has written two books, LifeNudge and HisNudge, sharing the idea of creating nudges that not only help move us in the direction of personal goals but ultimately in achieving God’s purpose for our life.